The concept of urban interior design has become increasing popular. People are finding ways to repurpose uncommon industrial components to create eye-catching, highly functional pieces of furniture within their home or office. Pallets have quickly become the primary medium for people with an urban industrial creative flare. The best part about pallet furniture is that you don’t necessarily have to be extremely handy or creative to make your own pallet furniture. In fact, all you need is a little imagination and a good design and you’re on your way. You can find thousands of different ideas and guides online in a matter of seconds. Here are a couple of simple, do-it-yourself pallet projects that can do that won’t cost a lot of money and are fun to do. 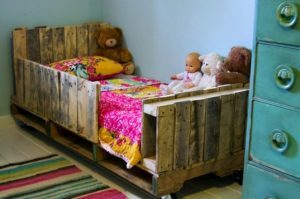 Using pallets to create a bed is not only going to give a unique look and feel to your home, it is also going to bring a lot of functionality to it. You will get the same support and strength as you would out of using a metal bed frame, with the added benefits of using the spacing between the pallets to create endless lighting and storage possibilities. Here are a couple of quick examples to give you an idea on what you can do. The Basics Of How To Make Your Own Bed – You can use the basic ideas from other do-it-yourselfers to create your own urban pallet bed masterpiece. Popular Pallet Bed Designs – This site has several pallet bed designs that show just how creative you can get. A lot of these beds are so incredible looking, it’s hard to believe they are made from pallets! Learn How To Add Lighting To Your Pallet Bed – Adding rope lighting or LED lights to your pallet bed can help not only create ambiance, but can function as a night light as well. Plans For Making A Pallet Headboard – Is your headboard broken? Rather than buying a new headboard or bed, make one yourself! Build Your Own Pallet Nightstand – After making your pallet bed, add in a pallet nightstand to tie everything together and add more functionality to your room. Have you ever noticed that when you’re shopping for a new desk that you typ ically have to redesign the entire room? Normally, this is because the desk you buy is either too big or too small for the space you intend to use it in. You can eliminate this headache by building your own desk using pallets. If you add pallet jack wheels to your desk, you can move the desk anywhere you need to without having to dismantle everything or wait for help. 19 Great Pallet Desk Ideas For Your Home Or Office – Rather than spending hundreds or thousands of dollars on a desk you might “like”, spend a fraction of that money to make a desk you’ll love. Making The Best Desk You Can With The Least Amount Of Supplies – Building a pallet desk doesn’t have to be complicated. This example focuses more on function than appearance. Finding Pallets To Make Your Desk And More – Finding pallets is not always easy. Here is a guide with several ways to find all the pallets you’ll ever need. The Pallet Bible – Need help on inspecting and dismantling pallets to make sure they are safe to use? The pallet bible has got you covered. 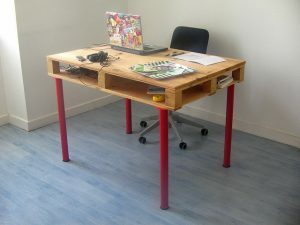 Pallet Corner Desks – Rather than finding a desk to fit the space, why not make a desk instead? These compact, sturdy designs can hold anything you can put on them, plus provide a ton of storage. Couches are an important mainstay to any home. They provide more than just seating for your guests; they provide a place for people to connect. 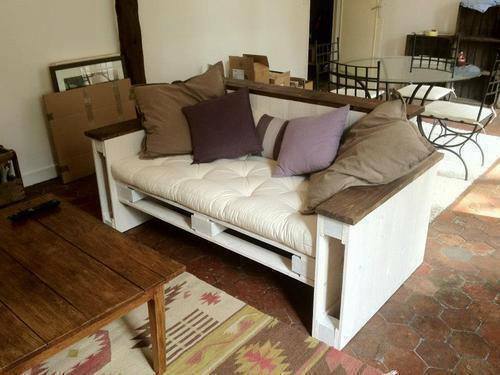 A pallet couch is great, especially for smaller homes. Put some pallet jack wheels on your custom pallet sectional couch and you can quickly convert it into a full-size bed (or larger) for your guests. Pallet couches not only add a touch of creative flare to your home, but they can also double or triple the amount of storage you have in a room. Pallet couches and other pallet furniture can be used to give a home rustic, clean look that can’t be found with other types of furniture. Basic Indoor/Outdoor Pallet Sofa Designs – Here are 30 of the more popular pallet sofa designs that anyone can create at home in no time flat. Making Your Own Couch Cushions – Need help making cushions for your new pallet sofa? No problem! Making the cushions is actually a lot easier than you think. Futon Pallet Couches And More – Adding pallet jack wheels a simple pallet couch plan can allow users to quickly transform their pallet sofa into a futon. Bring More Function To Smaller Rooms – If you have a smaller home, you need to make every inch count. Making a small sofa table to go behind your pallet couch can eliminate the need for a coffee table or end tables, without eliminating useful storage! How To Make Stylish Outdoor Patio Pallet Furniture – Does your outdoor living space need a little help? With a little bit of time, creativity and some solid pallets, you can have the most talked about outdoor entertainment setup in your neighborhood! While the look and style of a table is important, it has to come second to strength. We put a lot of things on tables. Sometimes, we even sit or stand on them. We expect them to hold everything from groceries to dinner and everything in between. So, when you go to make your own table, using pallets is a great way to ensure your table is going to be strong enough to handle anything you can throw on it, literally. Make Your Own Pallet Dining Table – If you want an easy-to-make dining table that is going to be strong, lightweight and durable, then this is the design for you. Making A Pallet Picnic Table – Making a picnic table out of pallets ensures that it has the strength and durability to exceed your expectations. The best part is, you can use different sized pallets to scale the size of the table to your specific needs. 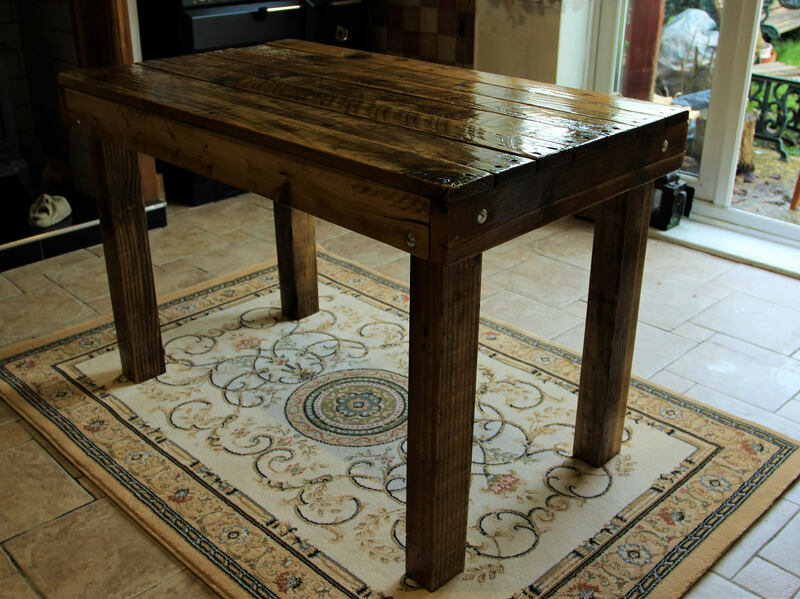 Making An Eye-Catching Round Table Out Of Pallets – You can use the different styles of wood from various pallets to create an eye-catching design that will make people think you spent hundreds of dollars on it. Quirky Pallet Coffee Table Designs – Pallets can be used to be imaginative coffee table center pieces for any occasion. Add a couple of pallet jack wheels or caster wheels and you can make it into a multi-purpose table that can be used for generations. Prepping Your Pallets – This site has all the information you need to identify what the codes on various pallets mean, as well as provide you with an overview on how to properly prepare to pallets for your do-it-yourself project.